Less than 10 miles from the heart of Colorado Springs, it’s hard to beat the accessibility of central Colorado’s North Cheyenne Canyon Park (a.k.a. North Cheyenne Cañon Park). 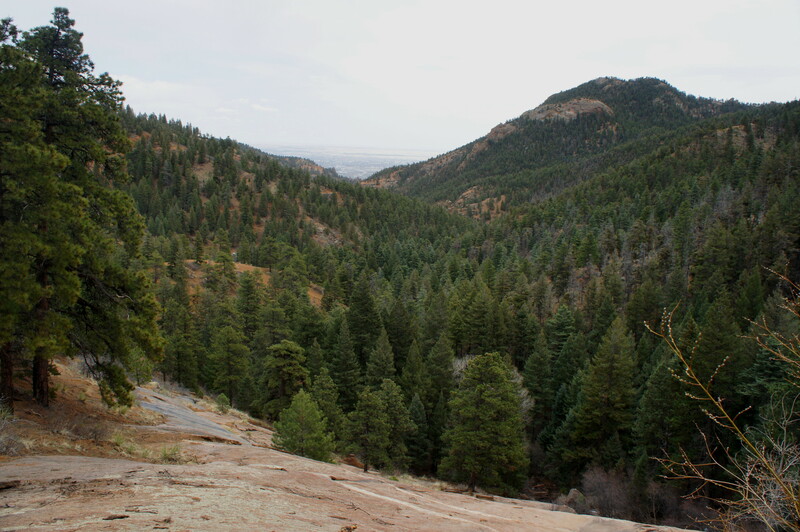 In fact, the 1,626-acre park is owned and managed by the city of Colorado Springs itself. The canyon cuts sharply into the evergreen-studded Front Range and boasts more than a dozen miles of hiking and biking trails. Among these is a short but steep trip to Silver Cascade Falls, a family-friendly hike offering splendid views of the canyon, the city, and two major waterfalls. Arrive early or late, as the popular trail becomes a human highway around midday. 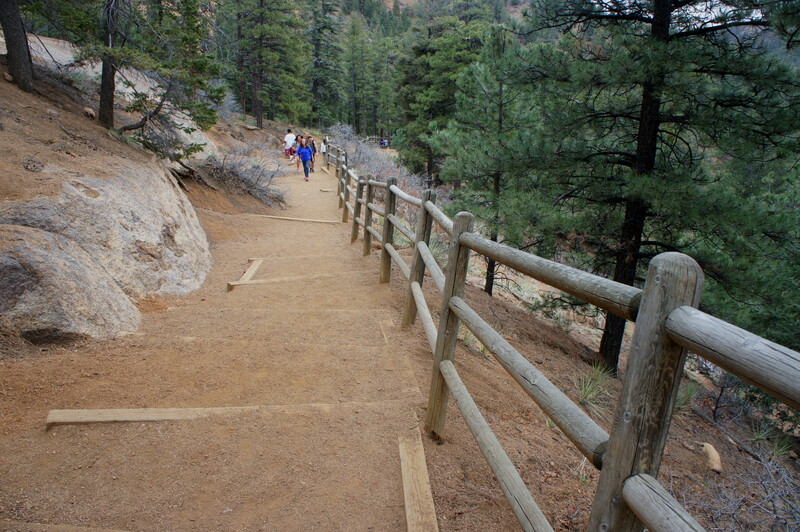 The Silver Cascade Falls Trail departs from the often-crowded parking at Helen Hunt Falls, located 2.6 miles up the paved North Cheyenne Canyon Road, west of Colorado Springs. 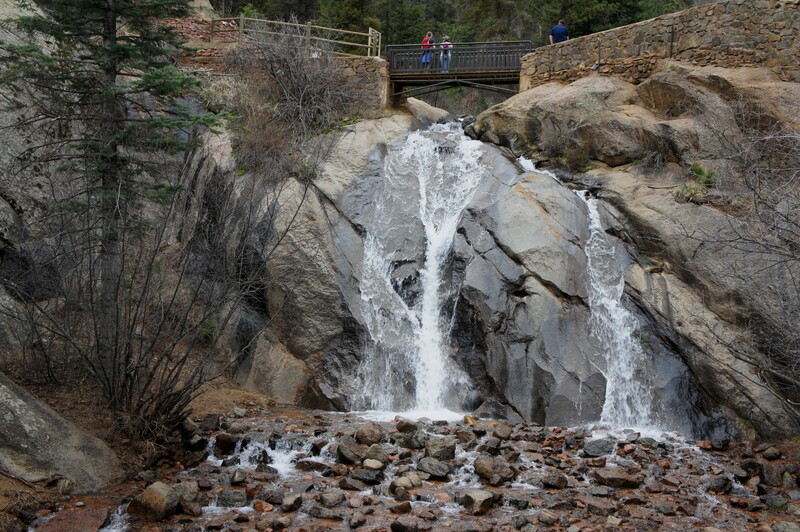 The Helen Hunt Falls Visitor Center is open seasonally. The first waterfall—Helen Hunt—is visible from the parking lot, and a short, dirt-packed footpath (with a few steps down) leads to the base of the falls. (Note: The falls are named not for the contemporary actress, but rather for 19th century poet, writer, and activist Helen Hunt Jackson, a leading advocate for Native American rights.) 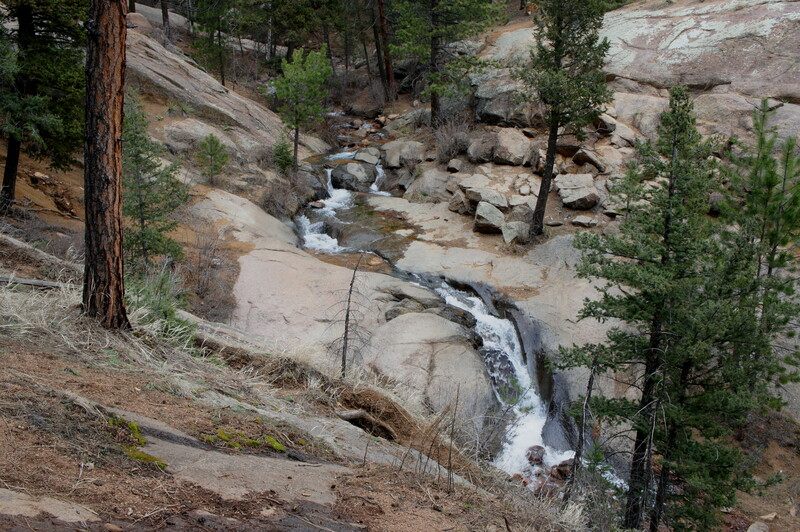 The flow of the falls varies but is usually most dramatic after snowmelt or recent rains. 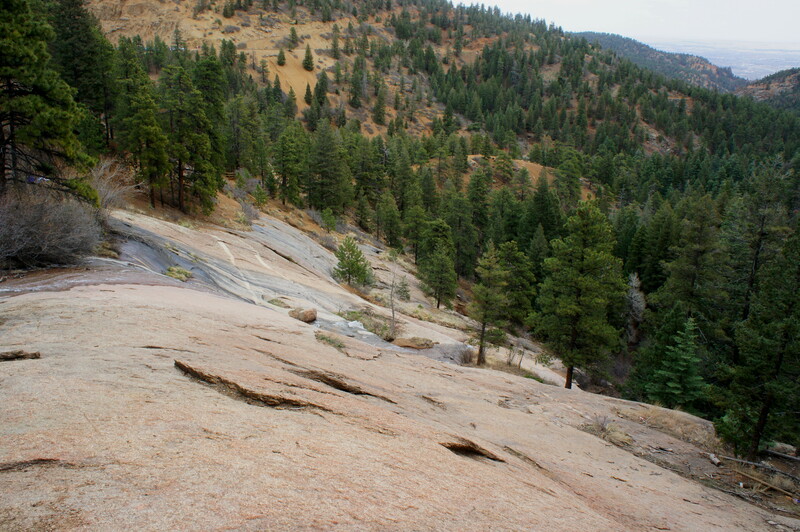 The hike to Silver Cascade Falls, a taller waterfall to the southwest, begins off to the right, climbing a steep flight of stairs to the top of Helen Hunt Falls, where a wooden bridge crosses Cheyenne Creek. After a short break at the bridge, the wide footpath resumes its steep climb, ascending the southern flank of the canyon amid firs and ponderosa pines. 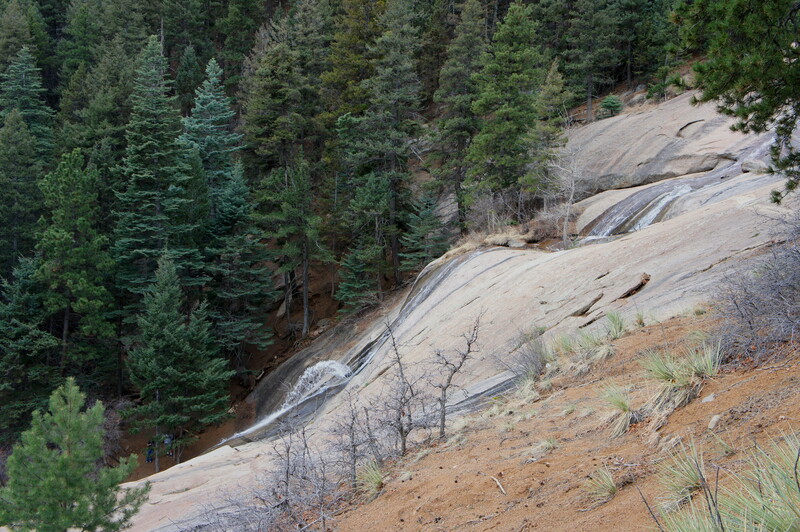 The creek below continues to tumble down a rocky slope of Pikes Peak granite before plunging over Helen Hunt Falls. Less than five minutes from the trailhead, the trail switchbacks abruptly to the left, then rounds a corner to reach the other side of a wooded ridge. The drainage below is a tributary of Cheyenne Creek and cuts through a steep ravine named Buffalo Canyon. Peering down Buffalo Canyon to North Cheyenne, the city of Colorado Springs can be seen through the V-shaped valley. Silver Cascade Falls is actually best viewed well before the end of the trail, at a bench halfway up the final, southwest-bearing climb. From here, water can be seen rocketing off a series of granite ledges, at times propelled into the air by minor rock jams. Return the way you came. Allot at least 30 minutes for the out-and-back hike. Try a longer hike in North Cheyenne Canyon Park or, better yet, an off-the-beaten-path trek in Pike National Forest’s Pikes Peak Ranger District. 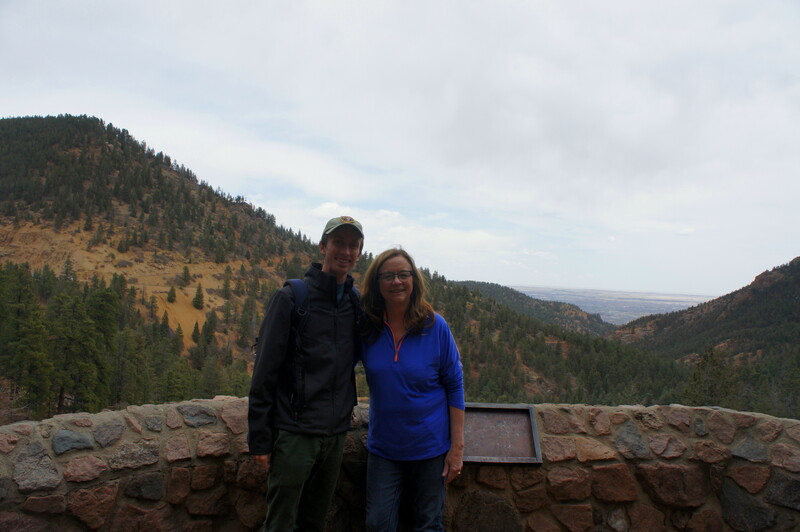 This entry was posted in Colorado, Colorado Springs area, Moderate Hikes and tagged Buffalo Canyon, canyon, Cheyenne Canyon, Colorado, Colorado Springs, Helen Hunt Falls, North Cheyenne Canon Park, North Cheyenne Canyon Park, Silver Cascade Falls, waterfall. Bookmark the permalink.